What we know about the past is limited the farther we go back in time. In order to adequately analyze any archaeological site and its artifacts, it is necessary to draw upon all the knowledge and theories those before have put on paper. There is evidence that people roamed the land on which Old Colchester Park and Preserve is now located as much as 10,000 years ago (8000 BCE). People were active in that spot through the colonial period. A few small areas of the park were in use domestically until very recently. But what does that mean in the context of our past? There will always be debate over dates, cultural periods, and specifics of what happened during each. Luckily for us, the Virginia Department of Historic Resources (VDHR) has set a standard for Virginia archaeologists to follow. Archaeologists in North America group time into two distinctive categories based on the huge shift in material culture that occurred when Europeans brought different materials and items. In Virginia, the settlement at Jamestown marks the beginning of this shift. This blog post’s focus is on the time periods before Jamestown changed the archaeological landscape. Note that B.C.E./C.E. stands for Before Current Era/Current Era is an alternative naming of B.C./A.D. Archaic period from ca. 8000 B.C.E. to 1000 B.C.E. The Evidence of human activity on Old Colchester Park & Preserve can be traced to the Early Archaic Period. While projectile points are not a particularly common find on the park, we have found a few. 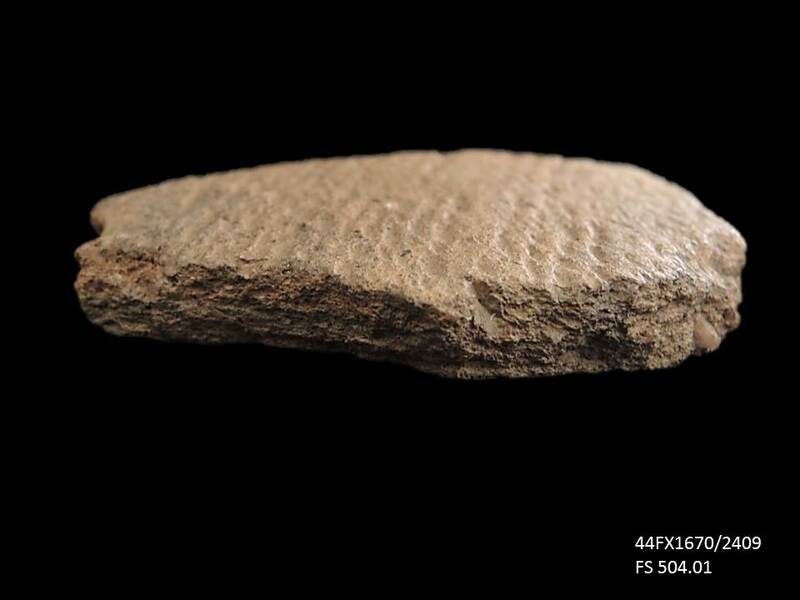 To ascribe a time period, it only takes one projectile point base. See Let’s Get to the Point about Typologies for an explanation on how we determine a time period by a projectile point base style. The Archaic Period is characterized by an increase and diversification of tool types and include new technologies such as side or corner notches in projectile points. The time period is further divided into the Early Archaic (8000 B.C.E. – 6000 B.C.E. ), Middle Archaic (6000 B.C.E. – 2500 B.C.E.) and Late Archaic (2500 B.C.E. – 1200 B.C.E.). Woodland period from ca. 1200 B.C.E. to 1600 C.E. The defining change in material culture between the North American Archaic and Woodland cultures is the invention of ceramic (aka heated or fired clay) cooking and storage vessels. While soapstone vessels were made prior to the woodland period, the emergence of ceramics has been linked with shifting settlement patterns. CART has found fragments of a variety of these vessels including soapstone tempered ceramics which may have been transitional from the soapstone vessels. At the very least, the ceramics are an indication that people moved through the area during the Woodland period. The Woodland period is subdivided into the Early Woodland (1200 B.C.E. – 500 C.E. ), Middle Woodland (500-900 C.E.) and Late Woodland (900 -1606 C.E.). If you would like more information about the Early, Middle and Late Archaic & Woodland, let us know and we may be able to add it to future blog posts. Egloff, Keith and Deborah Woodard 1992 First People: The Early Indians of Virginia. The Virginia Department of Historic Resources. Richmond, Virginia. Jennings, Jesse D. 1989 Prehistory of North America. 3rd ed. Mayfield Publishing Company. Mountain View, California. Virginia Department of Historic Resources 2011 Guidelines for Conducting Historic Resources Survey In Virginia. Appendix B. The Virginia Department of Historic Resources. Richmond, Virginia. This entry was posted in Archaeology, CART Historian. Bookmark the permalink.